PRLog - July 10, 2015 - COLUMBUS, Ohio -- Fond memories of time spent together often sustains us after the loss of a loved one, but families are concerned that remembrances will fade. 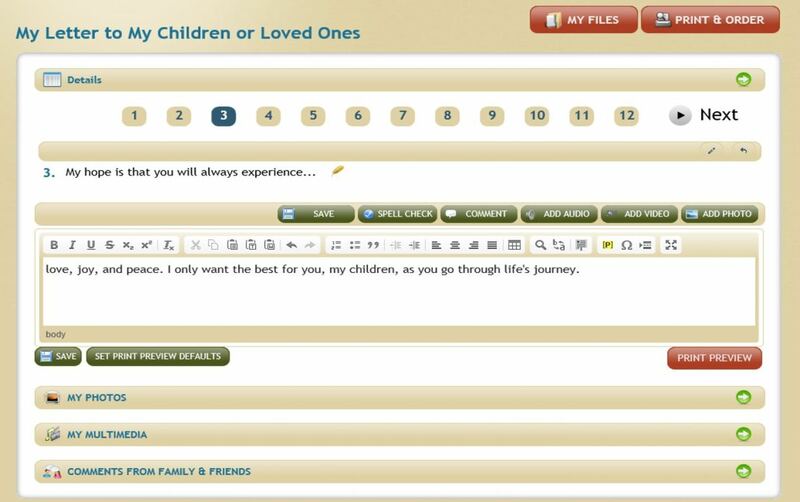 For a person facing death (especially mothers or fathers with small children or teenagers), writing a heartfelt letter that documents key information is the most precious and lasting gift that can be given. LifeBio is the first website to provide an online autobiography/biography system. LifeBio works with individuals, senior care, health care, hospice, financial planners, and estate attorneys. Call 1-866-LIFEBIO (1-866-543-3246 ) or email info@lifebio.com for more details. Visit www.lifebio.com to signup for a free trial (upgrades to full features are available starting at $7.99/month).